Lucy M. May is a contemporary dance artist, teacher, and writer based in Montréal, the unceded land known to the Kanien’kehá:ka Nation as Tiohtiá:ke. She is attracted to the porousness of collaboration and the vastness of dancing. 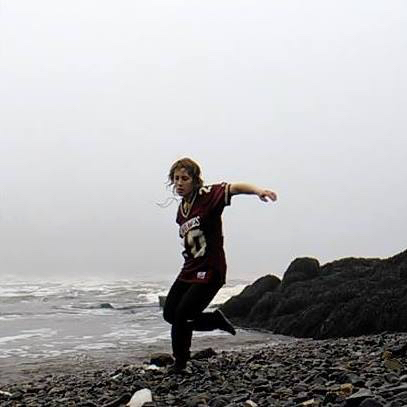 Currently, Lucy is creating performances and choreographic works that ask how geo- and bio-social environments thread their way through human movement. These include the in-situ performance Vivarium with Paige Culley, Noémie Avidar, and Patrick Conan; Esemplastic Landing (2016-2017) a solo three-month nomadic residency in New Brunswick; reaching over a brink of darkness, folding open to a starlight trepanation, an installation of drawings and movement; and Ascendants for six graduating students of l’École de danse contemporaine de Montréal. Lucy has presented her work in Québec, New Brunswick, Nova Scotia, the Netherlands, and Sweden. She is currently creating a new solo, Anima / Darkroom, for and with Krumper Vladimir “7Starr” Laurore. Between 2009 and 2016, Lucy was a member of Compagnie Marie Chouinard, creating roles for seven major choreographies, appearing in film and new media works, and touring internationally. Independently, she has performed works by Margie Gillis, Susanna Hood, Ariane Boulet, Alejandro De Leon, as well as Lesandra Dodson and Georgia Rondos − choreographers based in her natal province of New Brunswick. Lucy dances to wonder after what binds micro to macro, macro to micro. The workshops she teaches are alive to folk wisdom and anchored in participants’ own experience (Rustlin’ Vessels, Finger & Toes), and play with the foundations of professional dance training and knowledge (The Surprise Party!). Lucy imagines her moving body as a meeting place, where theories and conversations find confluence with what is local, sensual, or tactile. Lucy contributes frequently to The Dance Current and is a member of the Regroupement québecois de la danse and its Comité Inclusion et vivre ensemble. She is a graduate of LADMMI (École de danse contemporaine de Montréal) and Rotterdamse Dancacademie in Holland, and began studying Krump in 2016. She was recently invited to Ja Britton Johnson aka Jigsaw’s Krump fam as Ravage Grouch. Artiste en danse contemporaine, enseignante, et écrivaine Lucy M. May s’est établie à Montréal en 2003. La porosité de la collaboration et les marges de la danse lui attirent. Présentement, elle développe des performances (Vivarium; Esemplastic Landing; reaching over a brink of darkness, folding open to a starlight trepanation) qui questionnent comment les environments géo- et bio-sociaux se tissent au mouvement humain. Entre 2009 et 2016, Lucy était membre de la Compagnie Marie Chouinard. À titre de pigiste, elle travaille avec Margie Gillis, Alejandro De Leon, Sasha Kleinplatz, Melissa Raymond, et chorégraphes travaillant au Nouveau-Brunswick—sa province natale. Son propre corps mouvant, elle imagine, est un lieu de rencontre, là où théories et conversations confluent avec le proximal, le tactile, le sensuel. Elle danse, émerveillée par ce qui relie micro au macro, macro au micro. Lucy a étudié à LADMMI et Rotterdamse Dancacademie aux Pays-Bas. Au présent, elle crée un solo pour le Krumper pionnier 7Starr, à titre provisoire de Anima / Darkroom.